Alright, hopefully people will be enjoying their fun on Halloween. I work a weekend shift job so I won’t be partaking in that but best of luck and stay safe!. Anyway, for Halloween since I started about 4 years ago I have done a special write-up for Halloween, be it Master of Mosquiton, Vampire Princess Miyu, Dusk Maiden of Amnesia or Another. Well this year I am tackling an OVA, more specifically…. In the Kingdom of Forland a coup d’etat has occurred, done by a mad scientist and his minions. The princess Alita flees after witnessing the death of her father the king. However a chance encounter with a bounty hunter Falis leads to an unexpected situation: She and Falis, their souls switch bodies, ending up in a body swap situation. 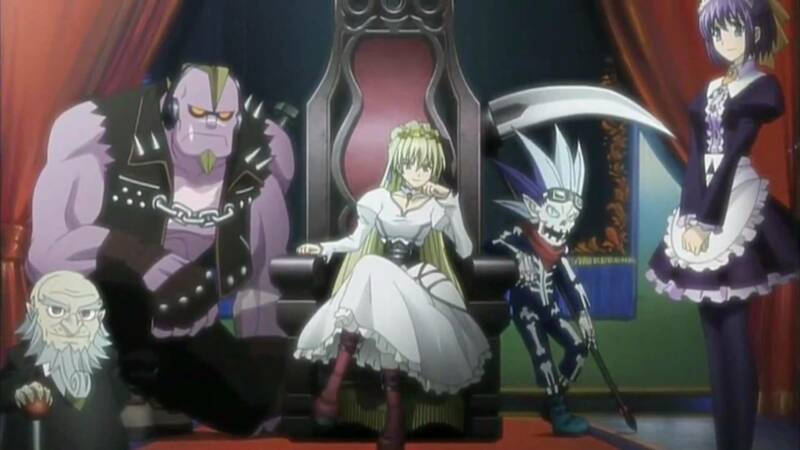 In the process of dealing with the coup d’etat, Falis as Princess Alita becomes the Murder Princess, with the princess Alita becoming a maid in Falis’ former body with the help of two lackeys of Falis, a giant brute and a skull-kid with a scythe. Together, they seek to find a way to reverse the situation they are in. But a mysterious sorceress and a black knight are on their trail, for what reason who knows, you will have to see. That’s basically episode 1 in a nutshell. Murder Princess, if nothing else, excels at being economical in terms of setup, characters and setting. Heck, the episode titles reflect this economical bearing. Yet it is surprisingly effective, especially for 6 episodes. In terms of genre, it is a fantasy adventure with some moments of comedy and serious drama with some dark edge to it. It breezes through telling its story and while ends on a note promising some more, I find that the OVA stands alone enough as is. Even when a big twist regarding the world that comes into play with episodes 5-6, it isn’t as unexpected given how foreshadowed it was. A flaw in the story I find is that some of the story beats are rather rote and predictable (example being the older brother Prince) where I just had to go ‘really who didn’t see that coming?’. But aside from that, it works fine from a story perspective. The characters are interesting enough to hold your attention, and I do like the relationship dynamics between this group of characters. Falis is quite great as a character, one is out for herself but finds that she does need to rely upon others for support. The thing that got me is the yuri overtones between Falis and Alita, which while only given out by hints, is only quaint and nice. Rest of the cast are molded from fantasy tropes/cliches but have enough individuality to not be stale. Now, Murder Princess is a really great looking short series. Bee Train really put in a lot of talent and effort here and it shows. Particularly in the fight sequences, of which there are many throughout, show a dynamic finesse and style not shown much elsewhere. Considering what else Bee Train is well-known for, no surprise there. There is a lot of bloody violence and gore so those weak of stomach might wish to avoid this. That said, the OP is really kickass and awesome with a soundtrack that’s appropriate enough for the occasion. The English dub is quite a solid effort from Funimation. Granted, this came out in 2009 back when they weren’t so full of themselves as I find them to be nowadays. Of course, given how the state of anime dubbing was in back in 2009 Funimation was really one of a few companies putting out good dubs. Anyway, Caitlin Glass directed the dub solidly and it features Colleen Clinkenbeard and Monica Rial. Both are really good in this and on top form in terms of vocal performance, especially when the body swap occurs. The solid effort extends to the rest of the cast as one can hear Wendy Powell, Patrick Seitz, Chuck Huber and Carrie Savage among others in the dub. The script is tight and appropriate in relation to the original translation, yet is natural to the ear. In short, Murder Princess is a nice fantasy adventure romp that runs through its story like a breeze with delightful characters, stunning action and music. Granted the story is a bit rote and has some predictable beats, I enjoyed watching it regardless. At the end of the day, sometimes that’s all that matters. Everyone have a safe and happy Halloween! Now what’s coming down the line for the rest of the year you may ask? Well, for the months of November and December I will be doing one review near the end of each month.They share a common genre, that of magical girls (mahou shoujo). One is from the past (20 years ago in fact) and the other is from a recent season (about one year ago). That is all I am saying at this moment. ‘Til next time dear readers.